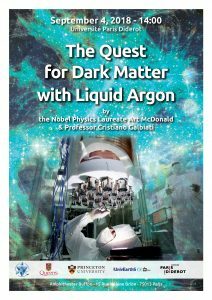 The APC laboratory is pleased to invite you for the conference “The quest for dark matter with liquid argon“, on September 4, 2018 in Paris at the Université Paris Diderot. We are honoured to welcome on this occasion the Nobel Physics Laureate Art McDonald and Professor Cristiano Galbiati of Princeton University. Gravitational effects that cannot be explained by visible matter are well documented, though their source remains deeply mysterious. One hypothesis about the nature of the so-called “dark matter”, motivated by considerations in elementary particle physics, is that it consists of as-yet undiscovered elementary Weakly Interacting Massive Particles (WIMPs). WIMPs make up the dark matter halo that pervades our galaxy, and their motion should result in WIMP-nucleus elastic collisions of sufficient energy to be detected directly by a sensitive detector on Earth. Liquid argon detectors play a major role in this search, especially if they take advantage of ultra-low background underground argon (UAr) extracted from deep wells in Colorado, featuring a specific activity in the cosmogenic 39Ar three orders of magnitude lower with respect to the atmospheric argon. Experimenters from four different argon dark matter searches are joining their forces to carry out a unified program for dark matter direct detection under the umbrella of the Global Argon Dark Matter Collaboration. The list includes researchers currently working on the ArDM experiment at LSC; on the DarkSide-50 experiment at LNGS; on the DEAP-3600 experiment at SNOLab; and on the MiniCLEAN experiment at SNOLab. The program is designed to lead searches for dark matter both in the high (>30 GeV/c2) and low (<10 GeV/c2) mass regions. Very recently, DarkSide-50, operating with UAr, and DEAP-3600 have completed major milestones of their programs by publishing results from ~20 and ~10 tonne-days exposure campaigns, respectively. The outcomes of the dark matter searches are null results. The discrimination between events induced by natural radioactivity and nuclear recoils – the potential candidate dark matter events – is outstanding, confirming once more that a future generation of liquid argon detectors will also be able to operate completely free of background and in a real discovery mode. The extremely low background of DarkSide-50 reached since the start of the run with the UAr target has allowed to obtain an extremely significant result in the search for WIMPs. The analysis of very-low energy events, characterized by the presence of the sole ionization events, has led to the world-best limits for masses below 6 GeV/c2. The improvement with respect to competing experiments is of one order of magnitude, thus bringing DarkSide into the lead. Researchers from the four experiments will jointly carry out the DarkSide-20k experiment, a 20-tonne fiducial volume dual-phase TPC to be operated at LNGS with an underground argon fill, designed to collect an exposure of 100 tonne-years, completely free of neutron-induced nuclear recoil background and all electron recoil background. DarkSide-20k is set to start operating by 2021 and will have sensitivity to WIMP-nucleon spin-independent cross sections of 1.2×10-47 cm2 for WIMPs of 1 TeV/c2 mass, to be achieved during a 5 year run. A second step in the program is the construction and operation of a detector with a fiducial mass of a few hundred tonnes, capable of collecting an exposure of several thousands of tonne-years, completely free of all backgrounds on top of CNNS. This follow-up experiment would also be capable of performing a set of very high precision measurement of several solar neutrino sources. This includes exquisitely precise measurements of pep, CNO, as well as low energy 8B neutrinos, all in the region of transition between the vacuum- and matter-dominated regions of solar neutrino oscillations. The Nobel Physics Laureate Art McDonald and Professor Cristiano Galbiati of Princeton University will illustrate the roadmap of the Global Argon Dark Matter Collaboration.